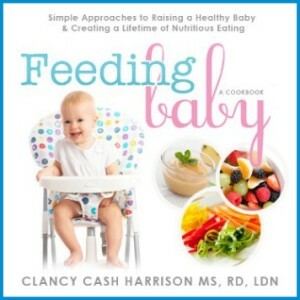 SuperKid’s Nutrition recently chatted with cookbook author Clancy Cash Harrison, MS, RD, LDN about her new book, Feeding Baby: Simple Approaches to Raising a Healthy Baby & Creating a Lifetime of Nutritious Eating. Clancy is a busy mom of two, a home cook, and a blogger with a mission to help families raise healthy eaters by teaching children about flavor through exploration and sensory experiences. What inspired you to write Feeding Baby? After I got married, I got pregnant and stopped working. I wanted to make my own baby food, and just being the type of person I was, I wanted to do something while I was at home. So I started blogging about my homemade baby food. A publishing company found my blog and asked me to write a book. It all fell together very nicely. It was an unexpected dream come true! 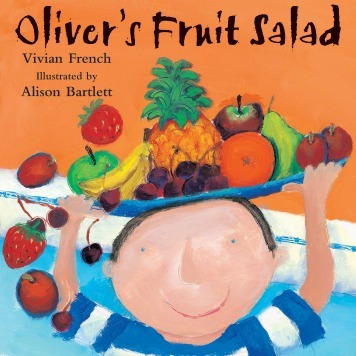 What would you say most distinguishes this cookbook from other infant cookbooks? What makes my book different is that I concentrate on the feeding relationship and creating a positive feeding environment. I focus on teaching the child to self-regulate and self-feed, but also to prefer different flavors by varying the texture and adding herbs and spices to baby food. 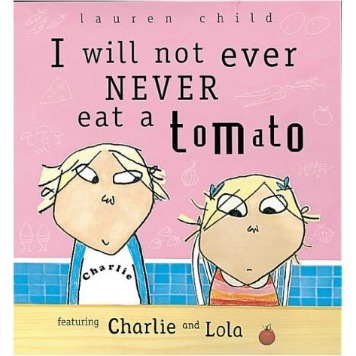 What’s your theory about picky eaters? What I’ve learned through my research is that there isn’t a true definition of picky eating. What one parent perceives as picky, another parent may not. Most people would probably consider my son to be a very picky eater. I refuse to call him picky. I just think that he has a different starting point with his palate. He does not like textures, so I concentrate on teaching him about taste. I think every child struggles with making choices and wanting to have freedom. It is completely normal to refuse food and prefer certain foods. It changes, day to day. I think it’s really in how the parent perceives it. Tell me about your process for developing recipes. I really try pairing different flavors. One of my favorite references is, The Flavor Bible by Karen Page and Andrew Dornenburg. I’m giving you my number one secret! The Flavor Bible is a great book. 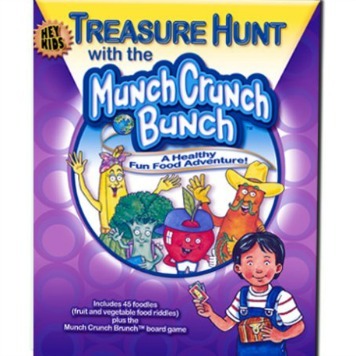 It doesn’t have any recipes, it just tells you which flavors work well together. Say I have asparagus and I want to make a puree for my child. I will look up asparagus and it will tell me what pairs best with it and also what pairs ok with it. I use that as a guide to add herbs and spices to my baby food. That’s how I create my recipes. I do have a couple favorites. The arugula goat cheese muffins are absolutely scrumptious. You can also cook them ahead of time and bring them out later. I also love the fig and feta salad. Actually, my girlfriends and I get together once a month, and we created that salad a couple years ago. When people come to my house, they want me to make the fig and feta salad. I do owe that to my friends. As a busy mom, it’s hard to find balance! Sometimes good nutrition goes out the door. Why is it so important for moms to make healthy eating a priority? I think it’s really important to make nutrition a priority because children are growing at a fast rate. We want to make sure that they are getting the nutrients they need not just to survive, but thrive, especially in today’s fast-paced world. They’re going to be busy too. We need to teach our children that health is a priority even when we’re busy. If they see you rushed and not taking time to cut up an apple or a piece of fruit and instead go through a drive through because it’s convenient, then you’re teaching them that it’s okay to do that. And sometimes it might be okay, but it should not be the norm. Do you have any tips for moms who work outside the home, but still want to provide home-cooked foods for their baby? Cooking in bulk really helps. 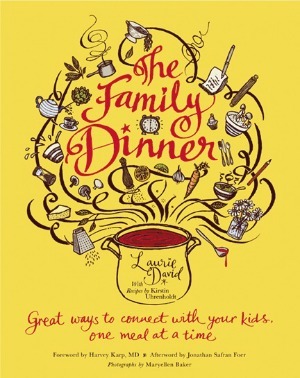 If you cook at least 2 meals on Sunday, then you can have 2 home cooked meals, plus leftovers. Planning ahead for the week makes meal time so much easier. That’s at least 4 meals that are home cooked. Crockpot cooking is also great. When I was working as a professor, I prepped my crockpot the night before. In the morning, I just plugged it in and I left. I came home. We ate our dinner. It was ready. During cleanup, I would just prep the next meal in the crockpot and put it in the refrigerator. I think just getting in a rotation and a schedule, and always being a meal ahead has helped me maintain a balance and not feel stressed. I noticed that you are donating a portion of this book’s proceeds to ‘The Michael J Foundation through Team Fox for Parkinson’s research.’ Why is this issue important to you? It’s definitely important to me. We have a family member who was diagnosed with Parkinson’s at a very young age. My husband and I wanted to do something for him. It just made sense to give my proceeds to Michael J. Fox, in honor of our family member, because I think it’s going to get the most awareness out there. Stephanie Schultz is a MS candidate in Nutrition Education and Dietetic Intern at Columbia University’s Teachers College. She is the mom of two active little boys, an avid cook, and an enthusiastic gardener. Her passion is teaching children how to grow, cook and enjoy healthful foods that nourish their bodies and help to sustain the planet.